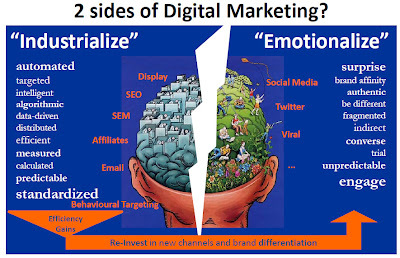 I have seen this slide presentation from Mirko Behnert about Digital Marketing and would love to share this cool idea, about his thought and presentation, it quite interest that he divide to two sides as Industrialize and Emotionalize. The keywords in the left and right, it is key element to make campaign achievement. For this figure, you can set up the communication strategy planning in clear path and you can priority your plan in different product cycle. One important thing, effective digital marketing campaign can't be standalone , it must integrated in order to support in different stage of searching, involvement, make purchase, retention to existing customers to secure the long term relationship.